Jerome’s preferred strategy is to work with two lovely assistants. When he commits to drawing a cartoon, it’s often a last-ditch effort to make the raffle sale. Some men are known to have a ready supply of pick-up lines. But what about “sell” lines? One of my benefit auction team members has a number of “sell” lines. He uses them when he’s selling raffle tickets, which is an activity he LOVES to do over any other benefit auction task. His name is Jerome. If he’s worked your benefit auction, you’ve seen him in action. 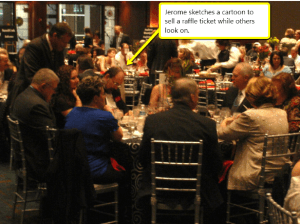 When his standard sell lines stop working, Jerome has been known to up the ante by tempting guests with another one of his talents: drawing cartoons. “I’ve just got 5 more $50 tickets available,” Jerome will egg on a guest. The guest shakes her head ‘no’ adamantly. “I’ll draw you a cartoon if you buy one of these last tickets from me,” Jerome teases. I was the recipient of a version of his cartoons last year when the RAA crew surprised me with this handmade birthday card. This is a simple cartoon created in a short minute when I was looking elsewhere. Most of the others I’ve seen him draw are more elaborate. With Jerome’s acknowledgement, the sale is quick. The woman asks that the cartoon be drawn for her daughter. 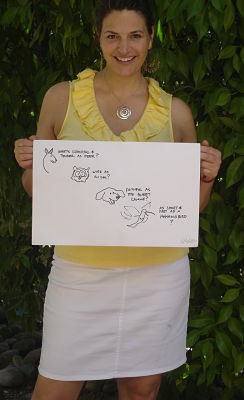 He rapidly sketches the chosen animal and personalizes it with an inspirational saying. The guest is happy, Jerome cleans out his raffle tickets, and the non-profit is amazed by how many tickets are sold. Jerome’s generosity and talent was formally acknowledged last week when he was recognized with Ocean City Music Pier’s first ever Immy Award. The award was created by Mark Soifer, Ocean City’s public relations director. The purpose of the Immy is to honor imaginative individuals who put their creativity to good use. I can see why Jerome immediately came to mind, given the thousands of drawings he’s made for people over the years. How much do I owe you for this endorsement? Jerry is AMAZING!! What TALENT……….